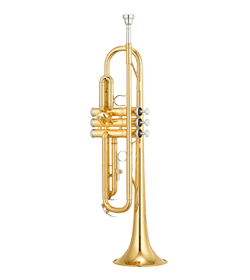 Welcome to the CMusic Production SOLO Trumpet II Library! 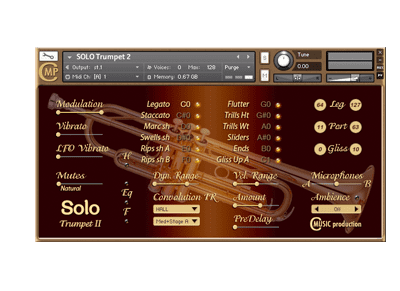 This SOLO Trumpet II Kontakt Library will allow you to realistically imitate virtually any melody that a real trumpet can play. It was recorded using two microphones (A – large diaphragm with a cardioid pattern and B – ribbon mic with a figure eight pattern). CMusicpro’s engineers, by means of these unique pairings, have produced a carefully-crafted finished product combining the condenser’s smooth, natural complexity with the ribbon’s extreme sensitivity. The large-diaphragm condenser signals were then summed, and the combined resultant tonal qualities were found to smooth the occasional harsh highs often produced by brass instruments. The end result is a clean clear high end. Additionally, this process enabled a truly mono-capable signal to be produced. Complete balance adjustments between A and B components are possible. Meticulous production techniques, combined with multiple articulations create the impression of a realistic live performance. We recorded all intervals for up and down articulations in three variants: normal Legato, Portamento and Glissando. We have provided the ability to vary the dynamics of the instrument to convey a wide, detailed range of expression from pp to ff. 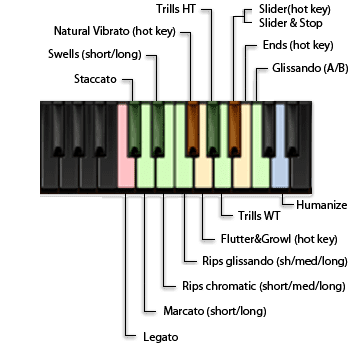 Natural and LFO vibrato may be added to the sound at any time. Sustain, Staccato and Marcato articulations provide added realism by means of a round-robin algorithm. The articulations and exclusive tone were specifically designed to enable your trumpet solo to stand out clearly “in the mix”.